Yuri Gagarin was born 9 March 1934 in the village of Klushino, near Gzhatsk (renamed Gagarin in 1968 after his death). His parents worked on a collective farm: Alexey Ivanovich Gagarin as a carpenter and bricklayer, and Anna Timofeyevna Gagarina as a milkmaid. [note 2] Yuri was the third of four children: older brother Valentin (born 1924), older sister Zoya (born 1927), and younger brother Boris (born 1936). Gagarin applied to attend the First Chkalov Air Force Pilot's School in Orenburg and was accepted as a cadet. He began his military training by flying Yak-18s. Gagarin was promoted to cadet-sergeant on 22 February 1956. Before he was permitted to fly a single-seat aircraft, he was required to show sufficient proficiency to a flight instructor. In one training incident, Gagarin was flying with an instructor. His takeoff and flight was acceptable, but while landing the instructor realized Gagarin was descending too quickly and took over the controls. An identical incident occurred in another training flight two weeks later. This was grounds for Gagarin's dismissal from the flight school. The commander of the regiment saw Gagarin performing fitness training alone in the rain. They decided to give Gagarin another chance at landing. The instructor gave Gagarin a cushion to sit on, which improved his view out of the cockpit. While the landing was still rough, it was within acceptable limits and Gagarin was permitted to solo. He soloed in a MiG-15 in 1957. He became a lieutenant in the Soviet Air Forces on 5 November 1957 after he accumulated 166 hours and 47 minutes of flight time. He graduated the next day. After graduation, he was assigned to the Luostari airbase in Murmansk Oblast, close to the Norwegian border, where terrible weather made flying risky. His assignment there was for two years. Three months into his assignment, he became a military pilot, third class. On 6 November 1959, he received the rank of senior lieutenant. Several of the candidates selected for the program did not have a post-secondary degree and were enrolled into a correspondence course program at Zhukovskiy Higher Education Academy. Gagarin enrolled in the program in September 1960 and did not earn his diploma until early 1968. A contemporary newsreel depicting Yuri Gagarin arriving at Moscow airport after his historic flight in 1961, greeted by Nikita Khrushchev. On 20 December 1963, Gagarin had become Deputy Training Director of the Star City cosmonaut training base. Two years later, he was re-elected as a deputy to the SSSU, but this time to the Soviet of Nationalities. The following year, he began to re-qualify as a fighter pilot. On 17 February 1968, he successfully defended his aerospace engineering thesis on the subject of spaceplane aerodynamic configuration, passing with flying colours. The date of Gagarin's space flight, 12 April, has been commemorated as a special date. 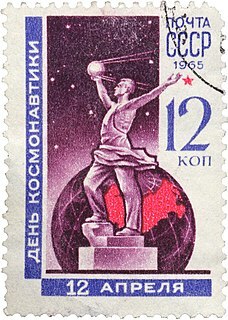 Since 1962, it has been celebrated in the USSR and later in Russia and other post-Soviet states as the Cosmonautics Day. Since 2000, Yuri's Night, an international celebration, is held annually to commemorate milestones in space exploration. In 2011, it was declared the International Day of Human Space Flight by the United Nations. In 2011, a statue, Yuri Gagarin, was unveiled at the Admiralty Arch end of The Mall in London, opposite the permanent sculpture of James Cook. It is a copy of the statue outside Gagarin's former school in Lyubertsy. In 2013, the statue was moved to a permanent location outside the Royal Observatory in Greenwich. In 2012, a statue was unveiled at the site of NASA's original spaceflight headquarters on South Wayside Drive in Houston. The sculpture, completed in 2011 by artist/cosmonaut Alexei Leonov, was a gift to Houston by various Russian organisations. Houston Mayor Annise Parker, NASA Administrator Charles Bolden, and Russian Ambassador Sergey Kislyak were present for the dedication. In April 2018, a bust of Gagarin, erected on the street which bears his name in the Serbian capital Belgrade, was removed, after less than week, following an outcry over the size of its head. Locals said that the tribute, was an "insult" to Gagarin. A new work will be commissioned. It was revealed that the city had had no prior knowledge of the design, and neither had the Serbian Ministry of Culture, nor the foundation which had financed it. 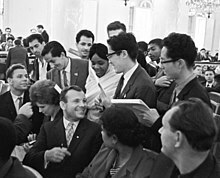 Jânio Quadros, President of Brazil, decorated Gagarin in 1961. ^ Gagarin's first name is sometimes transliterated as Yuriy, Youri, or Yury. ^ Alexey and Anna's names are sometimes transliterated as Aleksei Ivanovich and Anna Timofeevna, respectively (Bassin 2012). ^ Hall, Rex D.; Shayler, David J.; Vis, Bert (2007). Russia's Cosmonauts: Inside the Yuri Gagarin Training Center. Springer Science & Business Media. p. 332. ISBN 9780387739755. ^ Hanbury-Tenison, Robin, ed. (2010). The Great Explorers. London: Thames & Hudson. p. 270. ISBN 978-0-500-25169-0. ^ a b Tito, Dennis (13 November 2006). "Yuri Gagarin". Time Europe via Time.com. Archived from the original on 26 March 2008. ^ a b c Rosenberg, Jennifer. "Yuri Gagarin: The First Man in Space". About.com. Retrieved 26 March 2013. ^ a b c d e f Rodgers, Paul (3 April 2011). "Yuri Gagarin: The man who fell to Earth". The Independent. Archived from the original on 4 April 2011. ^ Burgess & Hall 2009, p. 42. ^ a b c Moskvitch, Katia (3 April 2011). "Yuri Gagarin's Klushino: Forgotten home of space legend". BBC News. Retrieved 4 April 2011. ^ a b c d e f g Bizony, Piers (14 March 2011). "First man of Space – the flight and plight of Yuri Gagarin". Engineering & Technology. 6 (3). Archived from the original on 26 March 2013. ^ a b c "Yury Gagarin: Biography". RIA Novosti. 30 March 2011. Archived from the original on 23 May 2012. ^ a b c d Rincon, Paul; Moskvitch, Katia (4 April 2011). "Profile: Yuri Gagarin". BBC News. Archived from the original on 22 January 2013. ^ Burgess & Hall 2009, p. 43. ^ Burgess & Hall 2009, p. 43–44. ^ a b c Burgess & Hall 2009, p. 45. ^ a b Юрий Алексеевич Гагарин. Astronaut.ru (in Russian). 11 July 2007. Retrieved 30 March 2008. ^ a b c d "The Vostok Missions". Soviet Russia's Space Program During the Space Race. Charles River Editors. 2015. ISBN 9781522702306. ^ Quoted in Siddiqi 2000, p. 262. ^ Siddiqi 2000, p. 262. ^ Siddiqi 2000, p. 261. ^ Bykovsky quoted in Gavrilin 1973, p. 26-27. ^ Louis, Victor E; Louis, Jennifer M (1980). Sport in the Soviet Union. Oxford: Pergamon. p. 43. ISBN 0-08-024506-4. ^ Hall, Shayler & Vis 2007, p. 135. ^ Sheldon, Charles. Histories of the Soviet/Russian Space Program. NASA. 1. Progressive Management Publications. ISBN 978-1549696589. OCLC 1019250543. ^ Siddiqi 2000, p. 275. ^ a b Душенко, Константин (2014). Большой словарь цитат и крылатых выражений (in Russian). Litres. ISBN 978-5-699-40115-4. ^ Первушин, Антон (2011). "6.2 Он сказал «Поехали!»". 108 минут, изменившие мир (in Russian). Эксмо. ISBN 9785457022300. ^ Quoted in Siddiqi 2000, p. 278. ^ Гагарин, Юрий (3 December 2004). Дорога в космос. Pravda via TestPilot.ru (in Russian). Archived from the original on 15 March 2008. Retrieved 30 March 2008. ^ "Motherland Hears (download)". SovMusic.ru. Retrieved 30 March 2008. ^ "Motherland Hears (lyrics)". SovMusic.ru. Retrieved 30 March 2008. ^ Полная стенограмма переговоров Юрия Гагарина с Землей с момента его посадки в корабль (за два часа до старта) до выхода корабля "Востока-1" из зоны радиоприема. Cosmoworld.ru (in Russian). Retrieved 30 March 2008. ^ "I am proud to be accused of having introduced Yury Gagarin to Orthodoxy". Interfax-religion.com. 12 April 2006. Archived from the original on 21 May 2013. Retrieved 30 March 2008. ^ "Gagarin's family celebrated Easter and Christmas, Korolev used to pray and confess". Interfax-religion.com. 11 April 2011. Archived from the original on 21 May 2013. ^ Первушин, Антон (October 2013). "7.1 Гражданин мира". 108 минут, изменившие мир (in Russian). Litres. ISBN 9785457022300. ^ На орбите дружбы. МК в Египте (in Russian). 24 April 2011. Archived from the original on 27 October 2012. ^ Callow, John (17 January 2009). "Yuri Gagarin in Manchester". WCML.org.uk. Retrieved 12 April 2010. ^ a b c French, Francis (July 1998). 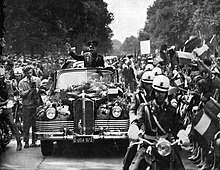 "Yuri Gagarin's Visit to Manchester". Spaceflight. British Interplanetary Society. 40 (7). Retrieved 7 March 2011. ^ a b Gafutulin, Nail (12 April 2011). "Космонавт и Депутат" [Astronaut and Deputy]. Red Star (in Russian). Retrieved 10 January 2015. ^ Krulwich, Robert (18 March 2011). "Cosmonaut Crashed Into Earth 'Crying In Rage'". Krulwich Wonders via NPR.org. Retrieved 12 April 2011. ^ "Юрий Алексеевич Гагарин" [Yuri Alekseyevich Gagarin]. Astronaut.ru (in Russian). 2 June 2013. Retrieved 10 January 2015. ^ "Gagarin". www.astronautix.com. Archived from the original on 2 November 2013. Retrieved 28 November 2015. ^ Lebedev, Vitaliy (August 2011). "Диплом Гагарина" [Gagarin's Diploma] (PDF). New Defence Order Strategy (in Russian) (16): 117–118. Archived from the original (PDF) on 14 January 2015. ^ Lebedev, Vitaliy (October 2011). "Диплом Гагарина" [Gagarin's Diploma] (PDF). New Defence Order Strategy (in Russian) (17): 68–69. Archived from the original (PDF) on 14 January 2015. ^ Aris, Ben (28 March 2008). "KGB held ground staff to blame for Gagarin's death". The Daily Telegraph. Retrieved 1 August 2008. ^ Holt, Ed (3 April 2005). "Inquiry promises to solve Gagarin death riddle". Scotland on Sunday. Retrieved 30 March 2008. ^ Osborn, Andrew (September 2010). "What Made Yuri Fall?". Air & Space. Retrieved 24 September 2010. ^ Osborn, Andrew (12 April 2007). "Kremlin vetoes new inquiry into mystery death of Yuri Gagarin". The Belfast Telegraph. Archived from the original on 14 January 2013. Retrieved 30 March 2008. ^ Malpas, Anna (8 April 2011). "Russia sheds light on Gagarin death mystery". AFP. Archived from the original on 26 March 2013. Retrieved 8 April 2011. ^ Leonov, Alexei; Scott, David (2004). Two Sides of the Moon. New York: Thomas Dunne Books. p. 218. ISBN 0-312-30865-5. OCLC 56587777. ^ "Death of Yuri Gagarin demystified 40 years on". RT.com. 14 June 2013. Archived from the original on 15 June 2013. ^ Major, Jason (14 June 2013). "Details of Yuri Gagarin's Tragic Death Revealed". Universe Today. Retrieved 17 June 2013. ^ a b c The First Man in Space. New York: Crosscurrents Press. 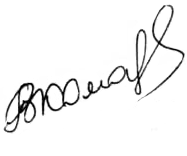 1961. p. 79. OCLC 220499322. ^ a b Abel, Allen (May 2011). "The Family He Left Behind". Air & Space. Retrieved 26 March 2013. ^ "Gagarin in his daughter's words". Euronews.net. 12 April 2011. Retrieved 27 April 2012. ^ Праздничные мероприятия, посвященные 50-летию полета Ю.А. Гагарина в космос (in Russian). Rea.ru. 11 April 2011. Archived from the original on 17 April 2013. Retrieved 27 April 2012. ^ Williams, Huw (7 March 2011). "Memories sought of Yuri Gagarin's way into space". BBC News. Retrieved 11 April 2011. ^ McKie, Robin (13 March 2011). "Sergei Korolev: the rocket genius behind Yuri Gagarin". The Guardian. Retrieved 11 April 2011. ^ "International Day of Human Space Flight, Cosmonautics Day in Russia". Sputnik. RIA Novosti. 12 April 2014. Retrieved 20 March 2019. ^ "Darwin's Day to Yuri's Night: Some science dates to remember". The Guardian. 20 September 2014. Retrieved 20 March 2019. ^ "UN Resolution A/RES/65/271, The International Day of Human Space Flight (12 April)". 7 April 2011. Retrieved 19 January 2015. ^ "Создана Военно-воздушная академия им. Ю. А. Гагарина" [Established Air Force Academy. Yu. A. Gagarin]. Boris Yeltsin Presidential Library. Retrieved 21 March 2019. ^ "U.S. Taking Russian Medal to the Moon". Chicago Tribune. Chicago, Illinois. 18 July 1969. p. 4 – via Newspapers.com. ^ Aldrin, Buzz; McConnell, Malcolm (1989). Men From Earth. New York: Bantam. ISBN 0553053744. ^ Pocock, Philip (2012). Geppert, Alexander C. T. (ed.). Imagining Outer Space: European Astroculture in the Twentieth Century. New York: Palgrave Macmillan. pp. 335–336. ISBN 0230231721. ^ Powell, Corey S.; Shapiro, Laurie Gwen (16 December 2013). "The Sculpture on the Moon". Slate. Retrieved 3 April 2014. ^ "Gagarin". Gazetteer of Planetary Nomenclature. USGS Astrogeology Science Center. Retrieved 25 March 2019. ^ Polmar, Norman; Bryer, Siegfried (1984). Guide to the Soviet Navy. Annapolis, Maryland: Naval Institute Press. p. 309. ISBN 9780870212390. OCLC 317097201. ^ Kaminski-Morrow, David (15 January 2011). "Picture: First Armavia Superjet awaits delivery". FlightGlobal.com. Retrieved 17 January 2011. ^ База данных по памятным и инвестиционным монетам. CBR.ru (in Russian). Archived from the original on 19 December 2008. Retrieved 30 March 2008. ^ "Yuri Gagarin Featured on Russian Gold and Silver Coins". Coin Update. 14 April 2011. ^ Fraser, Adam (19 May 2010). "UFA Sports to market Kontinental Hockey League". SportsPro Media. Retrieved 19 August 2010. ^ "Space Foundation Survey Reveals Broad Range of Space Heroes". Space Foundation. 27 October 2010. Archived from the original on 15 August 2012. Retrieved 17 January 2011. ^ Chilton, Martin (19 June 2013). "Yuri Gagarin movie attracts criticism". The Telegraph. Retrieved 20 March 2019. ^ "Cosmonaut Honored". Daily Press. Newport News, Virginia. UPI. 6 July 1980. p. 19. ^ Englund, Will (11 April 2011). "A half-century on, Russian space flight pioneer Yuri Gagarin stands tall". The Washington Post. Retrieved 19 March 2019. ^ Parfitt, Tom (6 April 2011). "How Yuri Gagarin's historic flight was nearly grounded". The Guardian. Retrieved 7 April 2011. ^ "Gagarin Monument Moved from London's Mall to Greenwich". RIA Novosti. 7 March 2013. Retrieved 13 April 2014. ^ "Houston Mayor, NASA Administrator & Russian Ambassador Dedicate Gifts of Artworks Honoring Russian and US Space Pioneers". City of Houston. 15 October 2012. Archived from the original on 13 August 2014. Retrieved 6 February 2015. ^ "Tiny head Gagarin tribute is removed". BBC News. 12 April 2018. ^ "Controversial Gagarin monument to be removed, new one built". B92. 10 April 2018. Retrieved 12 April 2018. ^ Riley, Christopher (11 April 2011). "What Yuri Gagarin saw: First Orbit film to reveal the view from Vostok 1". The Guardian. Retrieved 12 April 2011. ^ "Yuri's Night 2011 International Space Station Crew: 50th Anniversary of Human Spaceflight". YouTube.com. 11 April 2011. Retrieved 27 April 2012. ^ "The Gagarin Tourbillon". The Gagarin Tourbillon. Retrieved 27 April 2012. ^ Alexander, Michael (14 April 2011). "Yuri Gagarin Featured on Russian Gold and Silver Coins". Coin Update. Retrieved 22 March 2019. ^ Anikeev, Alexander (29 April 2011). 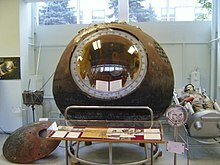 "Spacecraft "Soyuz-TMA21"". Manned Aeronautics. Archived from the original on 13 March 2012. Retrieved 1 May 2011. ^ a b Shapiro, Henry (14 April 1961). "Soviets Give Yuri Hero's Welcome". The Press Democrat. Santa Rosa, California. UPI. p. 3 – via Newspapers.com. ^ a b "Moscow Goes Wild About Spaceman". The Courier-News. Bridgewater, New Jersey. Associated Press. 14 April 1961 – via Newspapers.com. ^ "Czechs Honor Yuri". Daily News. New York, New York. Reuters. 30 April 1961. p. 35 – via Newspapers.com. ^ "Čestný titul Hrdina socialistické práce s právem nosit zlatou hvězdu Hrdiny socialistické práce" [Honorary title, Hero of socialist work with the right to wear golden star, Heroes of Socialist Labor] (PDF) (in Czech). ARCHIV KANCELÁŘE PREZIDENTA REPUBLIKY. Retrieved 11 April 2019. ^ a b c d e f g h "Гагарин Юрий Алексеевич" [Gagarin Yuri Alekseevich] (in Russian). Roscosmos. Retrieved 2 April 2019. ^ Ryan, William L. (27 July 1961). "Castro to Unify his Gains". The Morning News. Wilmington, Delaware. Associated Press. p. 3 – via Newspapers.com. ^ "Brazilian President Pins Medal on Yuri, Praises Space Flight". Tampa Bay Times. St. Petersburg, Florida. Associated Press. 3 August 1961. p. 7 – via Newspapers.com. ^ "Gagarin's Honors Piling Up Fast". The Springfield News-Leader. Springfield, Missouri. Associated Press. 15 April 1961. p. 1 – via Newspapers.com. ^ "British Queen Rolls Out Red Carpet for Yuri". Deadwood Pioneer-Times. Deadwood, South Dakota. UPI. 11 July 1961. p. 6 – via Newspapers.com. ^ "Gagarin Honored". Lincoln Journal Star. Lincoln, Nebraska. UPI. 1 February 1962. p. 20 – via Newspapers.com. ^ "Astronaut Meets Press at Moscow". The Times Record. Troy, New York. UPI. 15 April 1961. p. 22 – via Newspapers.com. ^ "Cosmonaut Gagarin Ill in Hospital". The Austin American. Austin, Texas. Associated Press. 13 October 1961. p. 31 – via Newspapers.com. ^ "FAI General Awards". FÉDÉRATION AÉRONAUTIQUE INTERNATIONALE. Retrieved 26 March 2019. ^ Locke, Robert (6 October 1976). "Space Pioneers Enshrined". Las Vegas Optic. Las Vegas, New Mexico. Associated Press. p. 6 – via Newspapers.com. Burgess, Colin; Hall, Rex (2009). The First Soviet Cosmonaut Team. Chichester, UK: Praxis Publishing. ISBN 978-0-387-84823-5. LCCN 2008935694. Wikimedia Commons has media related to Yuri Gagarin. Vladimir Mikhaylovich Komarov was a Soviet test pilot, aerospace engineer and cosmonaut. In October 1964, he commanded Voskhod 1, the first spaceflight to carry more than one crew member. He became the first cosmonaut to fly in space twice when he was selected as the solo pilot of Soyuz 1, its first crewed test flight. 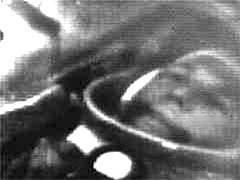 A parachute failure caused his Soyuz capsule to crash into the ground after re-entry on 24 April 1967, making him the first human to die in a space flight. 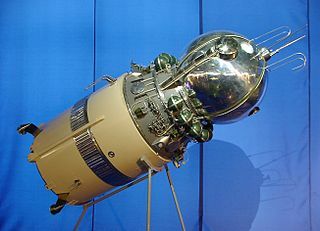 Vostok 2 was a Soviet space mission which carried cosmonaut Gherman Titov into orbit for a full day on August 6, 1961 to study the effects of a more prolonged period of weightlessness on the human body. Titov orbited the Earth over 17 times, exceeding the single orbit of Yuri Gagarin on Vostok 1 − as well as the suborbital spaceflights of American astronauts Alan Shepard and Gus Grissom aboard their respective Mercury-Redstone 3 and 4 missions. 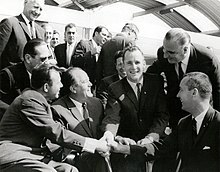 Indeed, Titov's number of orbits and flight time would not be surpassed by an American astronaut until Gordon Cooper's Mercury-Atlas 9 spaceflight in May 1963. Gherman Stepanovich Titov was a Soviet cosmonaut who, on 6 August 1961, became the second human to orbit the Earth, aboard Vostok 2, preceded by Yuri Gagarin on Vostok 1. He was the fourth person in space, counting suborbital voyages of US astronauts Alan Shepard and Gus Grissom. Pavel Romanovich Popovich was a Soviet cosmonaut. Valery Fyodorovich Bykovsky was a Soviet cosmonaut who flew on three space flights: Vostok 5, Soyuz 22, and Soyuz 31. He was also backup for Vostok 3 and Soyuz 37. Alexei Arkhipovich Leonov is a retired Soviet/Russian cosmonaut, Air Force Major general, writer and artist. On 18 March 1965, he became the first human to conduct extravehicular activity (EVA), exiting the capsule during the Voskhod 2 mission for a 12-minute spacewalk. Major General Vladimir Sergeyevich Ilyushin was a Soviet general and test pilot, and the son of aerospace engineer Sergei Ilyushin. He spent most of his career as a test pilot for the Sukhoi OKB In 1961, Ilyushin was the subject of rumors that he, rather than Yuri Gagarin, was the first cosmonaut in space. According to those rumours, his mission ended badly, and the Soviet Union had covered it up. Ilyushin was also a rugby union administrator who was inducted into the World Rugby Hall of Fame in 2013. Vasily Vasiliyevich Tsibliyev ; born on February 20, 1954) is a Russian cosmonaut. Cosmonautics Day is an anniversary celebrated in Russia and some other former USSR countries on 12 April. In Poland an "International Day of Aviation and Cosmonautics" is celebrated on the same day. In 2011, 12 April was declared as the International Day of Human Space Flight in dedication of the first manned space flight made on 12 April 1961 by the 27-year-old Russian Soviet cosmonaut Yuri Gagarin. Gagarin circled the Earth for 1 hour and 48 minutes aboard the Vostok 1 spacecraft. Gagarin: First in Space a.k.a.. First man In Space is a 2013 Russian docudrama biopic about the first man in space, Yuri Gagarin, and the mission of Vostok 1. It was released by Central Partnership theatrically in Russia on June 6, 2013, and in the United Kingdom on DVD on June 23, 2014 by Entertainment One. The film's running time of 108 minutes approximates the time it took Gagarin to go around the Earth before returning. It stars Yaroslav Zhalnin as Soviet fighter pilot and cosmonaut Yuri Gagarin. The film received mixed reviews, with some critics praising the film's acting, direction and storytelling with others touching on the film's "cheap-looking" visual effects. The film received criticism for its state funding and ignoring the aftermath of the flight.